Exclusive to IRONsearch.com! The below equipment specifications are brought to you from the IRON Guides -- the Official Guides of equipment valuation data for the industry. These specs represent the most popular equipment configurations for this model in the IRON Guides database, and are provided as general information only. These specs may not describe the manufacturer's original specs or the specifications for the actual equipment listed for sale. •	Bucket - Std. 78"
No matter what your line of work—landscaping, farming or construction—you’ll complete your jobs more effectively with a New Holland 200 Series skid steer loader. 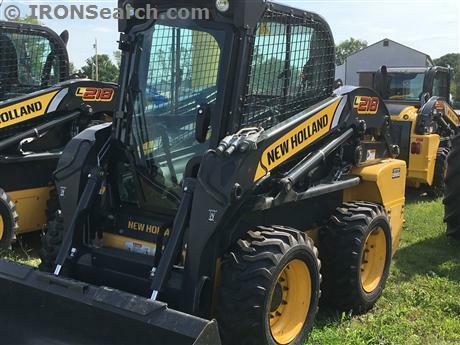 The New Holland product development team worked with over 1,000 valued New Holland and competitive skid steer customers for three years to develop final concepts for the 200 Series skid steer loader. The product development team then used virtual reality technology and New Holland’s Arizona proving grounds to test these concepts with prototype units and customer groups of landscapers, farmers, and general contractors. New Holland listened and designed a skid steer loader that met the challenges, answered the requests and fulfilled every wish list. It’s the skid steer loader you would want on the job – one that’s durable, reliable and productive. New Holland proudly manufactures the 200 Series skid steer loader. Type: Diesel 4-stroke, Turbo, I.D.I.